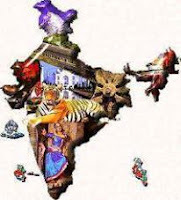 India GK Question Sample Paper 6: India General Knowledge (GK) Sample Question Paper No. 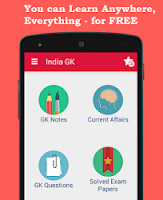 6 with Collection of India GK Questions under GK Quiz in PDF @ India GK Sample Papers. Q.131. Fatehpur Sikri symbolises ? Q.132. In fourth Anglo Mysore war (1799), Tipu was defeated and killed, who of the following did not get share in tipu’s territories? Q.134. The ryotwari settlement was primarily introduced by British Government in ? Q.136 The guerilla warfare was pioneered by ? Q.137. Panini was a famous scholar of ? Q.138. Who among the following were official Congress negotiators with Cripps Mission? Q.139. In the 'individual Satyagraha', Vinoba Bhave was chosen as the first Satyagrahi. Who was the second?